This delectable meal takes some time to prepare, but the results are worth every minute! 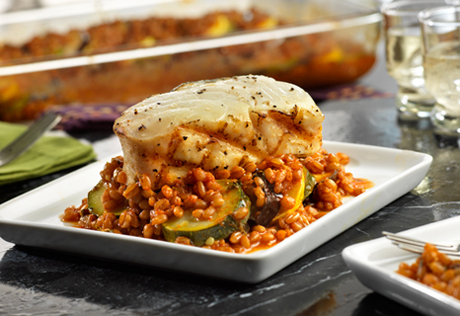 Grilled halibut is paired perfectly with a ratatouille that is bursting with the flavors of fresh vegetables in a creamy vodka sauce. Heat the oven to 400°F. Stir the wheatberries, sauce, wine, basil, parsley and red pepper in a medium bowl. Spread half the wheatberry mixture in the bottom of a 13x9x2-inch baking dish. Arrange the eggplant, zucchini and squash in two rows on top of the wheatberry mixture. Alternate 1 slice eggplant, 2 slices zucchini and 2 slices squash, overlapping slightly. Top with the remaining wheatberry mixture. Cover the baking dish. Bake for 45 minutes or until the vegetables are tender. Lightly oil the grill rack and heat the grill to high. Season the fish with salt and black pepper. Reduce the heat to medium-high. Place the fish on the grill, skin-side down, and grill for 6 minutes. Turn the fish over and grill for 6 minutes or until the fish flakes easily when tested with a fork. Serve the fish on the ratatouille. Cooking Basics: For beautiful grill marks, grill the fish for 3 minutes on one side, then turn the fish clockwise 1/4 turn. Grill for another 3 minutes, then turn the fish over and repeat with the other side.